A cartulary is a collection of loose charters (documents) copied in book form, both to make them easier to consult, and as a 'backup' in the case the originals get lost or damaged. Usually they contains records of properties and rights (rather than minor transactions), and are commonly arranged chronologically if they refer to rights, or geographically if they refer to property. This manuscript contains copies of about 36 royal and other charters granted to the Benedictine nunnery of Wilton, in Wiltshire. 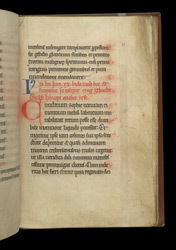 The rubric in the middle of the page introduces a charter granted by King Edgar ('eadgar'; d. 827) of 20 hides of land at Stanton ('stantune') in Gloucestershire, a little to the north-east of Cheltenham.